04. What messages should I send? Retention is the silent killer of SaaS businesses today. People get curious, kick the tires, shrug their shoulders and leave without saying goodbye. Even if you are acquiring customers for $10, if they only stick around for a month or two, you won't build a lasting business. Most people think retention is so crucial simply because it means you lose fewer users than you otherwise would. But a sound retention strategy is actually one of your most powerful levers to grow your business. A study by Price Intelligently showed that a 1% increase in acquisition affects your bottom line by about 3.3%. But improving your retention by 1% increases your bottom line by around 7%. That’s right: retention can be twice as powerful as acquisition. 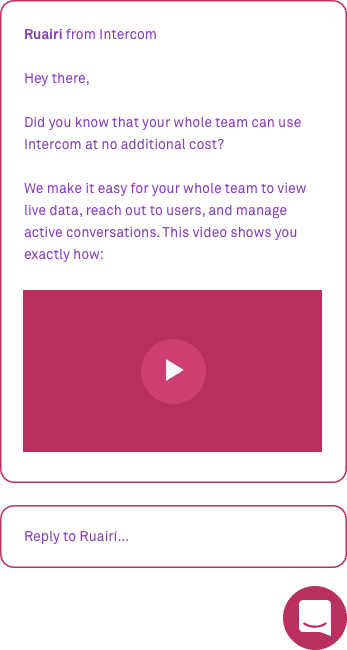 One retention tactic that works particularly well is lifecycle messaging: contacting users with in-apps and emails they will get value out of, based on their actual experience of using, or in most cases not using, your software. For example, imagine a project management app sending a “Getting Started” guide to someone who had not created a project after a week, but also sending a “How To Work With A Remote Freelancer” guide to someone who is actively using the product in a particular way in the weeks following that. Whether they are totally inactive or just not taking full advantage of your product, messages like these will prevent them jumping ship as soon as something cheaper or shinier comes along. Best of all, to create these message schedules you don’t need a “retention hacker”. You definitely don’t need a “retentioneer”. All you need is a few hours to create a simple campaign of messages that will pay back many times over. To continue learning about retaining your customers, and access to our future starter kits, enter your email below. The key to a good retention strategy is spotting the symptoms early. You'll know you're losing a customer when you see gradual disengagement. It's important you act during this window, because once a user is gone, they're very difficult to get back. 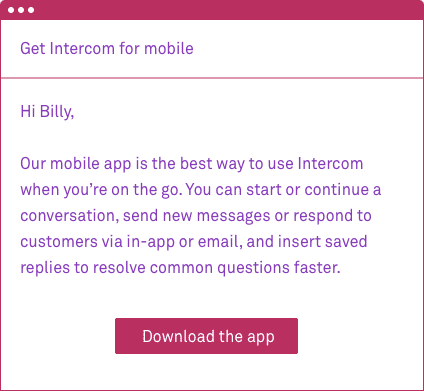 For a communication product like Intercom, we’ll message our users after 30 days of inactivity. But the first thing you should make a call on is what “slipping away” means for your business (for example, 7 days of inactivity would be worrying for a daily planner app). 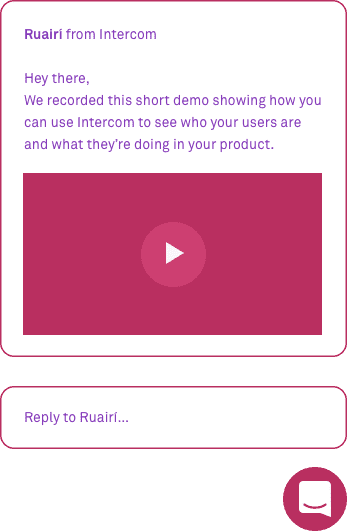 Ask yourself, “Does a user of my product need to engage on a daily, weekly, or monthly basis to be considered active?” Note: Intercom comes with a pre-defined “slipping away” segment that you can edit to whatever makes sense for your business. No matter how good your product is, your app isn’t a core part of your customers’ day-to-day lives overnight. But email is. If you notice periods of inactivity in those all-important first few days, behavioral emails will act like an extension of your product by relating directly to the actions your customers have taken (or not taken). This means you can reach people with relevant, personally tailored message that feel like a natural next step for them to take. Retention isn’t binary. There is a difference between someone who didn’t convert after a 30-day trial and a year-long user who has started to slip away. A trial user might require more education on the value of your product, while a lapsing user might require a check in from an account manager. Don’t let them both fall into a naive “we miss you” bucket. Treat them differently. Retention messages will only work if they’re laser focused in their accuracy. For example, if you’re speaking to a high-value customer who has contacted customer support several times already this month, your message will have to reflect that. Don’t email a customer who has several open support issues to remind them to login and don’t begin your mail with “Dear Customer”. Some amount of churn is natural. Businesses come and go, as does demand for your product. When a customer decides to leave, make sure they leave on good terms. If they have legitimate problems with your product, acknowledge them. Don’t delude yourself and fight back. Thank them for their support and let them go. The easiest way to screw this up is to continue to spam them months or years after their departure. It does more harm than good. 04 What messages should I send? The seeds of churn are planted the moment you acquire a customer. Even after initial onboarding, everything about your product is still unfamiliar, and you shouldn’t expect new signups to figure it out on their own. Create a “Getting Started” guide that’s brief, clear and proactively answers questions about features they might not be familiar with. For every passionate user who will do everything they can to upskill on your product, you’re going to have to try teach those who are little more reluctant. In educational theory they’re referred to as “grazers”. Unlike the hunter, they rely on being “fed” information to upskill them on a specific topic. Your product, for instance. By proactively teaching people how to be successful with your product, over time they begin to master it. They learn the esoteric features and the keyboard shortcuts, and this deep knowledge allows them to be drastically more productive using your product. When this mastery is achieved, the cost to the user of switching products becomes even higher, making churn much less likely. Facebook. Twitter. Google. Slack. These companies all have one thing in common – they create habits among their users. So how do you create these habits in your own product? If your product has a browser extension, desktop application, or mobile app, promote it via an email or in-app message and make sure it’s easy to add. By getting new users to integrate your product across multiple platforms, you’re increasing the likelihood your product will become a recurring part of their lives. For example, new Dropbox users who fail to install the mobile application won’t experience the full value of being able to access files anywhere. They will upload fewer files, use less space and are less likely to pay for more storage. 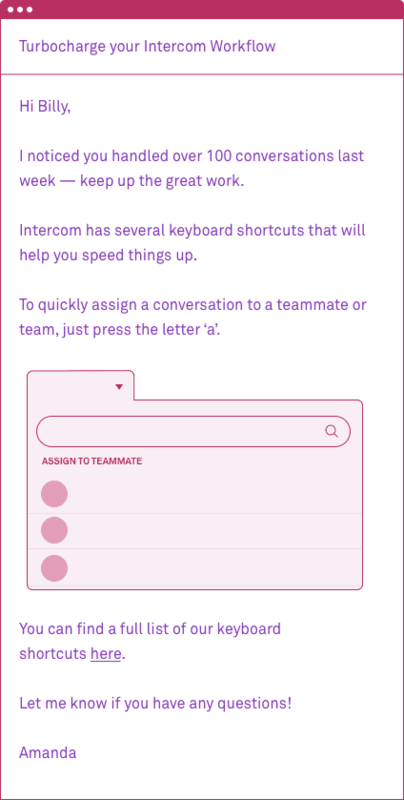 Encouraging users to build shared connections in your software is one of the best ways to make your product resistant to churn, especially for collaborative, team-based products like Asana, Intercom and Slack. By embedding your product deep into a company’s workflow, the product becomes an integral piece of how these companies operate and produce results, making it expensive to rip out. It’s important to know when to bring other people into the fold. You should only ask new customers to invite colleagues or teammates once they’ve reached a milestone, or indicated they’re sufficiently engaged with your product. (e.g has used a feature X amount of times, has imported custom data etc). Making such a heavy “ask” too early in the relationship will likely mean your request will go ignored. 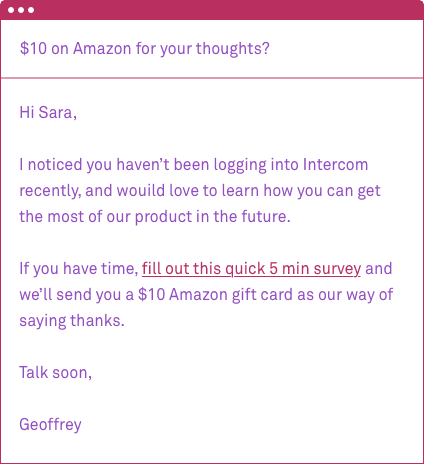 Customers don’t forget to use your product, they lose interest in it. So you have to motivate them. There are some features that will bring customers back, or keep them from switching. By offering churning customers a glimpse of what’s coming down the line, you can excite them about future releases. Things that inspire people to stick around are usually features which save time (e.g. better importing), increase adoption or efficiency (e.g. integrating with third parties), or offer additional value for no extra work (e.g. weekly reports). The best performing retention message we’ve seen is an email listing out all the features added in the past 30 days to users who are inactive for the past 30 days, ensuring that it’s always telling people about features they haven’t heard of. More importantly it follows the key rule of customer communication: don’t tell people to do something, motivate them to do it. Don’t take inactivity as a sign that people have lost interest forever. There are plenty of distractions from making the most of your product, especially if usage habits weren’t firmly established. You can offer one-time deals down the road or wait for a big product or company announcement to try to re-engage people. But even if you’re months away from the next big feature set or don’t have anything new to show off, there’s still valuable material you can offer dormant users, whether that’s educational content like books or a paid survey. Retention has become one of the most important topics among growth professionals today. While most SaaS companies are talking about and building products for acquisition, retention is what separates the most valuable companies from the rest of the pack. Casey Winters, growth advisor in residence at Greylock Partners, has built a career on writing, speaking and helping companies with their retention strategies. Winters was previously the product lead on the growth team at Pinterest and helped the company reach 150 million monthly active users. And going back, Casey was the first marketing hire at GrubHub, where – you may notice a pattern – he played an integral role in growing the customer base from 30,000 to 3 million. We sat down with Casey Winters to ask him about the most successful retention tactics he’s found in his career to date.